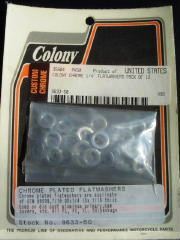 Chrome flat washers duplicate of OEM # 6099. 7/16 OD x ¼ ID x 1/16 thick. Used on all FL, FX, XL. When securing on die cast aluminum primary, cam covers, etc with a 1/4" Allen bolt.